A laser is a device which emits a light beam through a process of optical amplification that is based on the stimulated emission of electromagnetic radiation. Light beam travels in the form of regular high-energy ultraviolet rays in a single wave phase and emerges as short flashes in less than a second. The principle of laser action is to stimulate the atom to release a huge amount of photons and to focus it on the place where the laser beam is to be fired, so the greater the number of atoms, the more efficient the result. The laser has a single wavelength and very little diffraction, which makes its light focused on one point. Laser is one of the most widely used applications nowadays, it is used in the industry for the purposes of drilling and welding, in military fields for remote positioning and some commercial products such as laser printers and optical pens as well as in the medical field such as eye operations, on the other hand, the laser has a negative impact and dangerous to the health and the human body, its use may lead to a range of damage to the treated parts, so some of these damage and risk factors must be addressed. In this article, we will learn about the damage caused by the use of laser beams. Electronics industry: Lasers are used in the welding, cutting, and dissection of microelectronics; they are very precise because they are very small in size and used in the automotive industry. CD-ROMs: The CD-ROMs have the tremendous capacity to store information; they are about 660 megabytes (MB), which cannot be rewritten or erased; information is engraved on these disks and read with laser beams. Measuring distances accurately: This is done by passing laser beams on the area to be measured; they are easy to use and very accurate and are suitable for dangerous and very distances. By sending and receiving information and signals quickly between satellites. Personal hygiene is one of the most important things that should be taken seriously and should also be excellent. Many inappropriate tendencies have emerged in the modern era; one of them is hair removal that sometimes encounters us, and in particular stimulates a great effort to remove the body's excess hair specifically for females. Traditional methods are used for this and despite the effectiveness of some types, but like all other methods they are for a certain period of time, and then need to be repeated again to keep the body clean and free of excess hair, which sometimes causes discomfort and inconveniences in the body and mind such as excessive sweating and so unpleasant smell, in addition to the fact that most of these traditional methods causing pain, which makes most females looking for a better alternative. With the technological advances we are currently witnessing, what is known as laser hair removal has been achieved, but the question here is, do these rays have harmful effects on the body, such as causing diseases? Infection: The laser treatment area is sensitive and irritable, so it is more susceptible to infection, so care must be taken and cleaned constantly. Burns: Laser radiation is very high temperature, so sensitive skin exposed to burns when treated with laser, ranging from the degree of burns from mild to severe depending on the nature of the skin, and skin type. Due to the problem of unwanted hair in the body, women resort to hair removal in many ways and variety, and the most important way is guaranteed laser hair removal, because of its ease of use and effective results, but at the same time there is damage to laser hair removal. It is a safe way to remove unwanted hair, away from unsafe lotions available in the market. It does not affect the cells and pores of the body. It is characterized by rapid hair removal as the duration usually takes half an hour at most. Eliminates hair permanently, as the laser sends energy to the colored hair and stops its growth. It can be done in any area of the body as well as it handles more than one bulb at the same time. It is precise as it effectively removes hair. Unwanted hair may grow in areas adjacent to the treated area. It affects the hair of the wart, as it helps to increase its length. It can only affect the hair that is in the growth stage. It is difficult to remove laser hair in one session, as the body needs several sessions to remove it. It leads to pain, tingling, and numbness throughout the body. Skin pigmentation: White spots that appear on the skin because melanin is prevented from reaching the skin due to laser use or dark spots appear due to increased melanin secretion in the laser-treated area. Skin irritation, redness, Itching, and sometimes swelling may occur for the area exposed to laser because the lasers are strong and intense but these symptoms temporary stretching for several hours or sometimes days after exposure to the laser; these damages are natural and disappear after a short period of use of the laser. Feeling localized pain and tingling in the treated area. Skin injury due to heat caused by laser radiation, sometimes it causes burns to the skin, especially to dark skin, because the laser contains a high temperature used to burn excess hair. The color of dark skin has the ability to absorb more heat than light skin. 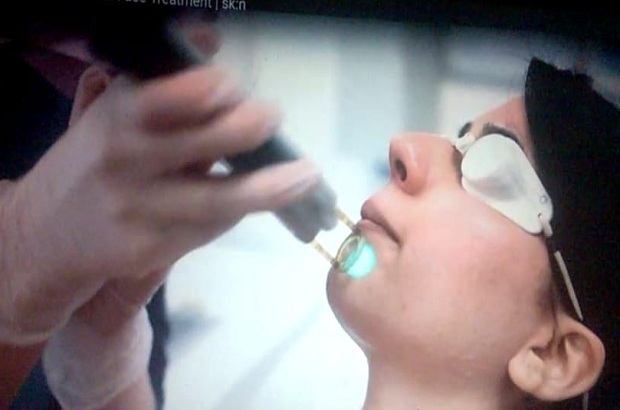 The numbness of the skin, which is accompanied by a sense of pain due to being in contact with the laser centered on the skin, and sometimes the color of the unique skin, can change in the area exposed to the laser. The skin may become infected if preventive measures are followed after laser hair removal. Exposure of human skin to laser in normal quantities and for very long periods of 15 years or more, increase the risk of that person to cancer, but if exposed to the laser beam centrally and continuously, it can cause cancer within a few years. The retina is exposed to burns, as the laser beam is directed to the eye centrally for several hours. Blindness if the person continues to be exposed to the laser beam on the eye for more than an hour per day, and continued exposure to the same quantity for several consecutive days estimated at least seven days. If you are a white-skinned person, you should be careful when removing the hair because it leaves wounds and scarring at the place of removal. The laser, by its nature, targets dark skin the most. Laser treatment does not hurt sensitive areas, in addition, does not lead to skin cancer as listed. You should put an ointment cream on the skin before starting to remove the hair. Do not remove laser hair if you have skinned body. Before you start laser hair removal, you should consult a specialist before you can find out about some of the safe hair removal devices, the right laser type for your skin, the negative and side effects of hair removal, and the number of sessions needed.